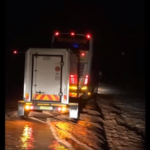 Video: Terrified bus passengers filmed floodwater flowing knee high around the Intercape bus after it was forced from the road. Passengers aboard an Intercape bus lived through moments of terror when floodwater forced the vehicle from the road and threatened to drag the bus down a raging torrent of wild water. The flash flood was allegedly caused after the wall of an earth dam in the bed of normally dry river bed broke when heavy rain fell over large parts of Southern Namibia. The bus driver decided to take on the flood water raging over the road surface between Keetmanshoop and Grunau and got into trouble when the bus was forced partially off the road. Water from the flash flood flowed over the road for a distance of at least two kilometres. The incident occurred at about 23:00 on Friday evening and passengers were stuck on board the bus for hours. Members of the farming community and emergency service from Keetmanshoop assisted by volunteers managed to heave the bus back onto the road surface with heavy machinery and after establishing that the vehicle suffered no damage it was able to continue on its way. Floodwater and flotsam from the dry riverbed also inundated a road bridge nearby and volunteers had to clear dead trees and mud from the bridge to establish if it suffered any structural damage. By sunrise on Saturday morning all obstacles were cleared from the road surface and the bridge was declared safe for use which allowed traffic to start flowing normally again.